Along with the liver, the pancreas is one of the master chemists of the body. In fact, it’s two chemists in one. The pancreas is a gland about the size of a hand, tucked between a bend in the upper part of the intestines (the duodenum) and the stomach. One function of the pancreas produces enzymes for the digestive system in the exocrine tissue. The other function of the pancreas creates hormones as part of the endocrine system. Within the pancreas the tissues of both systems intertwine, which makes it difficult to treat the pancreas because things that work on one system very easily damage the other. In essence, the pancreas is a digestive organ in that all its functions relate to digestion and the regulation of nutrients entering the blood stream – especially sugar in the form of glucose. While its exocrine function connects directly to the small intestine through a system of ducts, the endocrine pancreas connects to the rest of the body through the blood and nervous systems. Both systems react to the demand for energy and the complex chemical biofeedback controlled process of digestion. The stomach breaks down the bulky food you eat and starts the process of reducing the large nutrient molecules with gastric acids. The intestines carry out the task of absorbing the nutrients into the bloodstream. The pancreas, with its ducts leading into the top of the small intestine, plays a crucial role in digestion by secreting enzymes that cut apart large nutrient molecules, making smaller molecules that can be absorbed into the bloodstream through the walls of the intestines. Within the pancreas, acinar cells produce the digestion enzymes, which travel in pancreatic juice into the duodenum through a system of ducts (which produce the pancreatic juice). Many of the pancreatic enzymes are actually proto-enzymes; they require another chemical in the duodenum to transform into an actual enzyme. For example, trypsinogen, produced in the pancreas, activates in the presence of enterokinase, produced in the duodenum. When activated, trypsinogen becomes the enzyme trypsin. This method of activating an enzyme only in the duodenum protects the pancreas from destruction by its own enzyme production. The stomach delivers its decidedly acidic contents, called chyme (pronounced ‘kime’ as in lime) to the intestines. As it enters the duodenum, the chyme mixes with pancreatic juice, which is alkaline (a high concentration of bicarbonate ions) that neutralizes the gastric acids. This makes enzymatic action more effective. The pancreas stores many of the enzymes it produces, waiting for a signal – from hormones or nerve impulses – to release them into the duodenum. In this way, many of the hormones and enzymes of the pancreas are sensitive to body signals related to stress (for energy production), quantity of food types (fats, carbohydrates and proteins), and alcohol. Pancreatic polypeptide – produced in gamma (γ or PP) cells. The islets weave their way among a dense network of capillaries that facilitate transferring hormones into the bloodstream. The hormones produced by the pancreas are crucial to regulating the digestive system, most critically the level of glucose (sugar) in the blood. It doesn’t take of leap of imagination to understand that a gland producing chemistry intimately linked to the digestion of food and drink is sensitive to lifestyle abuse. Overeating and obesity, eating a diet high in fats or sugars, and heavy drinking of alcohol are typical of things that stress the pancreas. Long-term stress on any organ, including the pancreas, often leads to disease. People don’t readily notice problems with the pancreas until they become acute, which often means the underlying disease is far advanced. Unfortunately, most of the diseases of the pancreas are serious and frequently fatal. Diabetes type 1 and type 2 directly relate to problems with insulin and therefore involve the pancreas. Glucagon and insulin are the two primary hormones – both produced by the pancreas – that stimulate or depress the level of sugar (glucose) in the blood. Insulin is apparently the less robust of the two, as more than 350 million people suffer from type 2 diabetes alone. In type 1 diabetes, the pancreas completely loses the ability to produce insulin. In type 2 diabetes, insulin resistance, the cells of the body partially or fully lose their ability to use insulin. Either way, the level of blood sugar increases and, if untreated, will cause serious damage to the body and is fatal in some situations. There are other forms of diabetes mellitus, some due to genetic factors, and others to pregnancy, cystic fibrosis, and steroid use. All forms are detectable through blood tests for glucose levels and all are treatable. Both type 1 and type 2 diabetes are chronic, incurable diseases although regular insulin injection is effective in controlling type 1 and lifestyle changes combined with medication are effective in controlling type 2. The main problems with all types of diabetes are the long-term effects. Cardiovascular disease has long been associated with diabetes, as has chronic kidney failure and damage to the eyes (diabetic retinopathy). High levels of blood sugar are notorious for damaging blood vessels, which can affect the cardiovascular system in many and sometimes subtle ways. Diabetes doubles the risk of cardiovascular disease. Damage to the retina also relates to capillaries affected by blood sugar levels. Diabetes also affects the nervous system, commonly with various forms of neuropathy – numbness, tingling and pain in the feet in particular. Long-term effects of diabetes can be more serious than the original diabetes. Pancreatitis is almost always a serious condition requiring hospitalization for treatment. The most common immediate cause is pancreatic enzymes that activate in the ducts of the pancreas rather than in the duodenum. The enzymes eat the tissue of pancreas causing bleeding and potentially infection – leading to inflammation. There are many causes, but two stand out: gallstones blocking pancreatic ducts usually cause acute pancreatitis, and chronic pancreatitis is associated with alcohol consumption. These two causes account for about 80% of pancreatitis cases. Most cases of pancreatitis are treatable, the mild acute conditions from simply not eating for about five days. Pancreatitis often causes severe pain, which requires hospital treatment with morphine. However, severe acute pancreatitis is extremely dangerous as complications with lung collapse, dehydration, shock from low blood level (hypovolemia) and kidney failure are a possibility. Cancer of the pancreas comes in several forms, although about 95% of cases are adenocarcinoma tumors that develop in the exocrine ducts and tissue. Pancreatic cancers are malignant and prone to metastasis. Since they are often diagnosed in later stages, the prognosis for pancreatic cancer is poor, among the worst of human diseases. It accounts for the fourth-highest cancer fatality rate in the world, with a one-year survival rate of 25% and a 5-year survival rate of 5-6%. 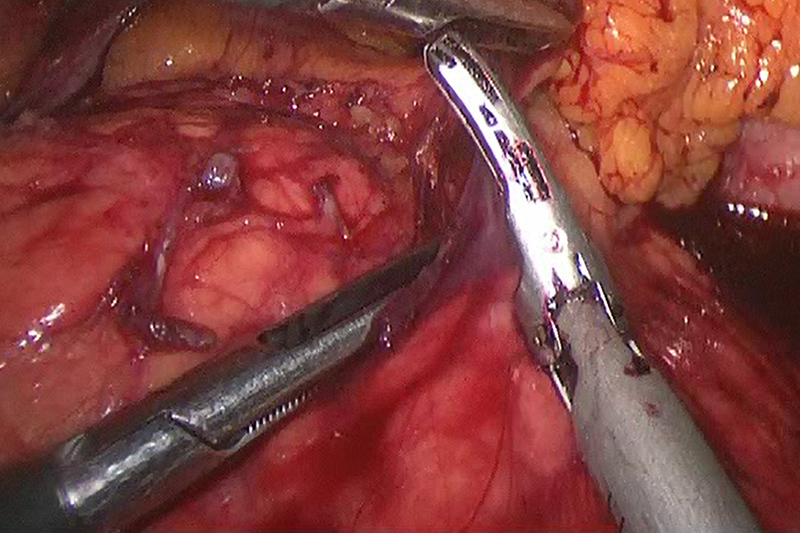 Minimally invasive techniques are being increasingly applied to pancreatic resection for malignancy. Factors that help determine the resectability of the tumor include its location in the pancreas as well as its relationship to the surrounding blood vessels and organs. 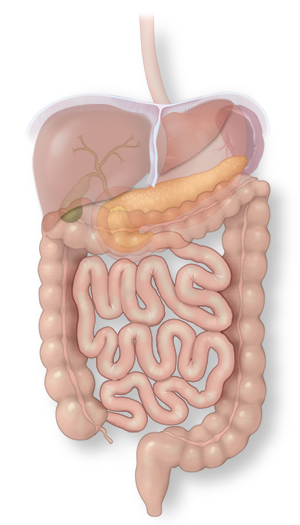 This image demonstrates some of the surrounding tissue between the pancreas and the stomach being dissected in the early stages of an operation. The location of the cancer is important for symptoms, diagnosis and treatment. Although chronic pain is common to all later stage pancreatic cancers, malignancy in the tail or body of the pancreas usually produce pain and weight loss. Malignancy in the head of the pancreas produces weight loss, jaundice (yellow skin color) and an inability to digest fat (steatorrhea). Cancer in the endocrine cells of the pancreas is possible, but rare, roughly 1.5% of all cases. This form of pancreatic cancer is often benign, and will be undiagnosed or intentionally untreated. Depending on the stage, treatment for exocrine pancreatic cancer may be radiation, chemotherapy or surgery, alone or in combination. Tumors located in the tail of the pancreas (the distal portion) are the most likely candidates for surgery through resectioning, or removal of a portion of the pancreas. The procedure, a distal pancreatectomy, is often performed with minimally invasive techniques – a laparoscopic pancreatectomy. In the most positive cases, this type of surgery can be curative. Chemotherapy and radiation are generally non-curative for pancreatic cancer, and are most often used as follow-up for curative surgery, or as a palliative measure to improve the quality of life. Because the prognosis for pancreatic cancer, and in fact, almost all other pancreatic diseases is poor, the function and treatment of pancreas disorders is a high priority for international research. Several high profile cases, the most well known being the death of Steve Jobs (Apple co-founder and CEO), put the pancreas, pancreatitis and pancreatic cancer directly in the public eye. The research is broad, ranging from development of new pharmaceuticals to treat diabetes to new techniques for surgery and chemotherapy on pancreatic cancer.